Given the bland star personas of the many contemporary Hollywood actors perpetually beholden to their publicists and personal trainers, revisiting the career of Jack Nicholson provides a fascinating history lesson regarding changes in the nature of celebrity and American culture more generally. Throughout Becoming Jack Nicholson: The Masculine Persona from Easy Rider to The Shining, Shaun R. Karli argues that Nicholson’s roles in films produced during (or in close proximity to) the 1970s reveal an actor particularly invested in bringing countercultural values to the fore through a rigorous examination of ways in which the ‘establishment’ foments and imposes norms relating to masculinity upon men during this period. As such, Karli identifies Nicholson as “the most representative actor of the 1970s” (3), due to an “innate rebelliousness” (3) that ostensibly exceeds the rebellious quotient of likeminded peers such as Dustin Hoffman or Al Pacino. 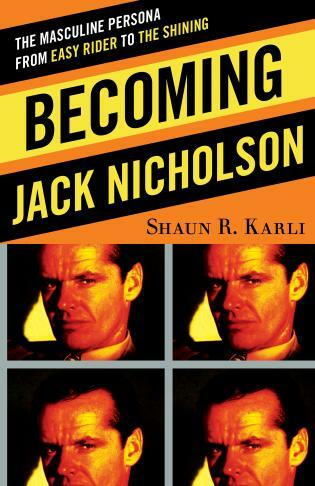 Over six chapters, Karli traces the ways in which Nicholson refined his popular persona through a series of self-aware performances in eight key films: Easy Rider (1969), Five Easy Pieces (1970), Carnal Knowledge (1971), The Last Detail (1973), Chinatown (1974), The Passenger (1975), One Flew Over the Cuckoo’s Nest (1975), and The Shining (1980). Karli situates Nicholson’s various characters – and their accompanying explicit or implicit critique of masculinity – within two loose categorical designations: as performances that actively resist the oppressive gender ideals upon which mainstream society is organized or as roles that embrace male privilege to such an extreme degree that they become parodic of, and critical towards, heteronormative masculine ideals. For example, One Flew Over the Cuckoo’s Nest and The Shining represent opposite, yet similarly self-negating, extremes of this spectrum. For Karli, then, a self-destructive impulse underpins both the determined resistance and the excessive conformity to the dominant forms of masculinity that are found in Nicholson’s work from this period. One of Karli’s central presumptions across Becoming Jack Nicholson is that audiences of this era developed an intertextual perception of these films; that is, Karli suggests that audiences brought an awareness of an extra-diegetic ‘Jack Nicholson’ persona into each subsequent screening of the star’s performances during and around the 1970s. In this way, Nicholson’s roles function in an almost dialectical manner, as each one revises the critique offered by the previous and points towards future potential iterations of ‘Jack Nicholson’. Where some might see repetitive performances – or perhaps even a lazy slippage between Nicholson’s ‘real life’ self and his starring roles – Karli (and the viewers who he imagines throughout his book) detects a meticulously crafted and evolving social critique embedded within Nicholson’s madness onscreen. Although Karli supports his arguments with excerpts from interviews in which Nicholson comments upon his intentions when selecting projects, it would have been useful if a larger amount of material from professional reviews also was referenced. Such contemporaneous sources from individuals not involved with the production of Nicholson’s films could have indicated a popular awareness of an evolving ‘Jack Nicholson’ persona from film-to-film. Instead, Karli’s readers are left to wonder if the strategically subversive intentions informing Nicholson’s performances became clear only in hindsight, rather than as the star’s notoriety grew over the course of the decade. Overall, Karli’s thorough readings of the six primary films considered in Becoming Jack Nicholson are convincing, but a few omissions may strike some readers as curious. For instance, Karli makes passing references to The King of Marvin Gardens (1972), but its relevance to his general thesis and to Nicholson’s career is significant. In addition to being one of several collaborations between Nicholson and director/screenwriter Bob Rafelson through BBS Productions – the pair previously co-wrote Head (1968) and Nicholson starred in Five Easy Pieces, both of which were directed by Rafelson – The King of Marvin Gardens offers a fascinating complication of the ‘Jack Nicholson’ persona discussed by Karli. Here, Nicholson’s ‘masculine persona’ is far more subdued and less demonstrative than in other films, as the actor portrays a low-key radio personality who struggles with a dangerously compulsive brother (played by Bruce Dern). If, as Karli argues, Nicholson’s characters continually allude to a trans-filmic persona, then surely a movie in which Dern plays what typically would be Nicholson’s unhinged part (while the rebellious icon himself reacts to Dern’s mania) self-reflexively engages with Nicholson’s reputation. Karli also offers very little consideration of how Nicholson’s work prior to Easy Rider might have informed his career choices in the 1970s. Nicholson’s script for The Trip (1967) and his role in Psych-Out (1968) both function as stepping stones to the more accomplished Head and Easy Rider, which immediately followed these two psychedelia-oriented exploitation films. Similarly, Karli does not address either of Nicholson’s two directorial efforts in the 1970s – Drive, He Said (1971) and Goin’ South (1978) – in relation to the star’s own performances. Providing more than cursory references to these other films would have helped Karli to illuminate further the subversive reach of Nicholson’s contributions to American cinema. In Becoming Jack Nicholson, Karli ably explicates the development of the ‘Jack Nicholson’ persona across eleven years’ worth of screen roles; however, widening the focus of the study to include Nicholson’s behind-the-scenes work and his earlier or atypical performances from this era would have opened up opportunities to examine more fully Nicholson’s multifaceted career. Even with a narrow scope, Karli’s book serves as a compelling snapshot of a truly iconic figure whose place in film history is assured, despite many dubious and decidedly non-rebellious roles in latter-day films such as The Bucket List (2007).